Reference number for this case: Autumn-54-Saint-Marien. Thank you for including this reference number in any correspondence with me regarding this case. Ufologist Jean Giraud indicated in the magazine Lumières Dans La Nuit #130 of December 1973, that during a counter-investigation in search of witnesses of UFOs in the Creuse, he learned from Mr. Aupetit, the witness of the observation in Les Vétisons, that it was said at the time of autumn 1954 that inhabitants of Saint-Marien, in the north of the Creuse department, at the limit of the Cher, would have fired with rifle at a "flying saucer" on the ground. Jean Giraud notes that "these remarkable hunters had to make great efforts to be forgotten because to date we have not yet managed to contact them." Jan d'Aigure (aka Jean Giraud), at the time of one counter-enquiry in the search of UFO witnesses in the department of the Creuse, learned from the witness Mr. Aupetit, of the observation in Vétisons, that it was said at the time of the autumn of 1954 that inhabitants of Saint-Marien, in the north of the Creuse, near the limit of the department of Cher, had opened fire from shotgun on a "flying saucer" on the ground. D'Aigure notes that "these remarkable hunters had to make large efforts to make themselves forgettable, for as of today we did not succeed in contacting them." Someone was said to have shot at an unidentified object on the ground. Note: contrary to what Peter Rogerson indicates, there is nothing on this matter in the book of Michel Figuet and Jean-Louis Ruchon of 1979, neither on page 82 nor elsewhere. And it was not supposed to be "someone", but several people. [ja1] "Plein feu sur la Creuse - à la mémoire de J. G. Dohmen", article by Jan d'Aigure (pseudonym of Jean Giraud), in the ufology magazine Lumières Dans la Nuit (LDLN), France, #130, pp 15-16, December 1973. 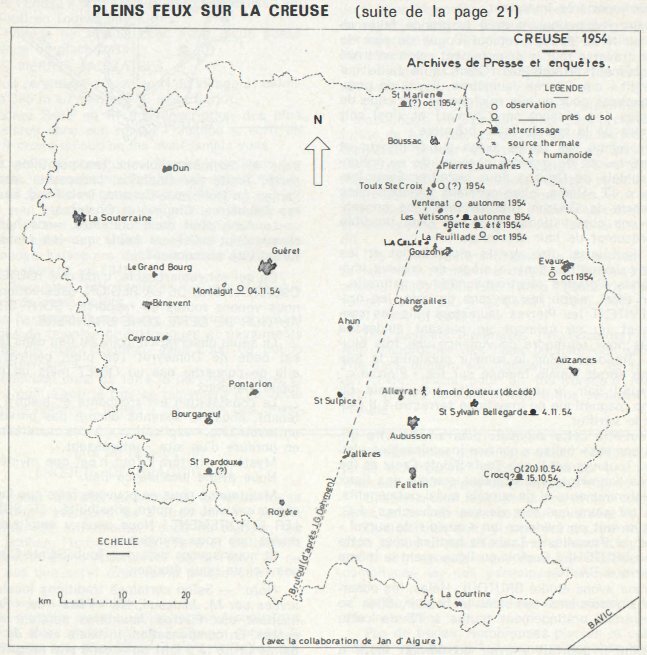 [ld1] Observations map for 1954 in the Creuse in the article "Pleins feux sur la Creuse (4 - Fin)", by "Jan d'Aigure" (Jean Giraud), in the ufology magazine Lumières Dans La Nuit (LDLN), France, #132, page 22, February 1974. 1.1 Patrick Gross April 22, 2019 Additions [ld1], [pr2], Summary. Explanations changed, were "Not looked for yet."